Planning a family vacation? An intimate getaway with the one you love? 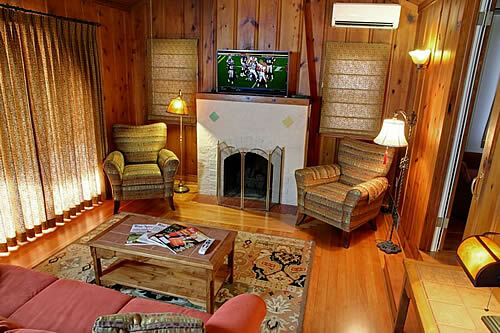 Or perhaps a reunion with friends or business associates … the California Gold Country cottages, suites and vacation rentals listed below offer a wealth of options for short to mid-length lodging. While the ambiance and amenities of each property is distinctly different than the others, the common thread is their commitment to providing a quality stay for travelers to Sutter Creek and its sister towns and communities. “The Carriage House at Avio”, offered by Stefano & Lisa Watson, is vineyard lodging at its best. This completely private, one-room guest cottage, with capacity for two people, is decorated in an upscale authentic western theme. 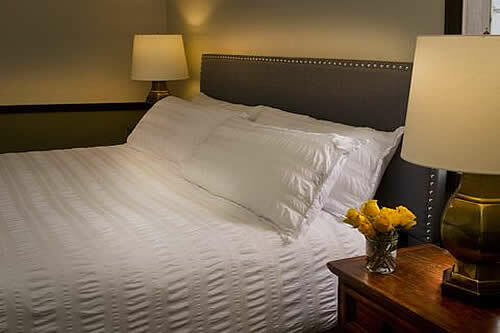 You’ll enjoy amenities such as a private full bath, king size bed, fireplace, TV, DVD & CD player, and use of the pool. There is also a separate private kitchenette with a refrigerator, microwave and toaster for your use. We’ve paid attention to every detail to ensure your stay with us will be a memorable one. Custom features abound; from the authentic cowhide headboard and chenille throw on the full-length overstuffed leather sofa, to the burlap walls decorated with authentic spurs/bridles, and an antique saddle from the 1800’s. At the end of the day, you’ll feel you’re truly the master of the estate as you enjoy a complimentary bottle of champagne to toast the sunset’s glow on the vineyard. Our home is ideal for up to four guests. 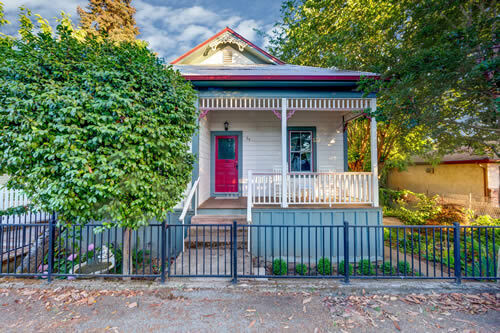 It features an old-fashioned front porch (with a swing), central heat and air, french doors, hard wood floors in the living areas and carpet in bedrooms, great natural light, a mix of antiques and comfortable modern furnishings–and thoughtful details throughout. Opal Street is a balance of un-fussy luxury and the simple pleasures of living in the country. Steps away from downtown Sutter Creek, the cottage was built in the late 1940’s and recently been remodeled to characterize its roots. It is a quaint 1,200 square foot 2 bedroom, 1 bath house. The place is ideal for 2 couples or a family with 2-3 kids. It sleeps 4 comfortably with a futon available for a 5th person. The pine-paneled living room feels cozy and has a gas-burning fireplace. There are fir hardwood floors throughout the house and a recently remodeled bathroom with a luxurious Corian shower. The dining room is next to a fully functioning kitchen. You can enjoy the outside patio with a gas barbecue for your use. Beautiful gold rush building with wainscoting and modern amenities. Two suites with bedroom, sitting area and private bathroom. Walking distance to Sutter Creek restaurants, antique shops, art galleries and 11 wine tasting rooms. The suites are upstairs above our family-owned winery, Feist Wines. 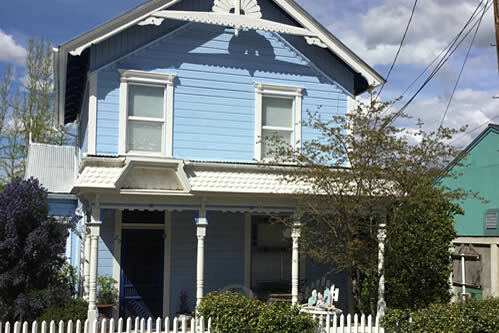 STAY in a lovingly restored comfortably equipped Victorian, vacation rental house for a delightful week or weekend. 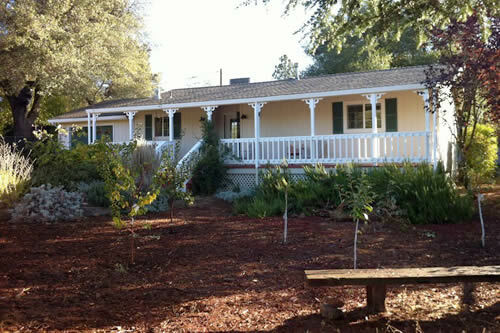 This charming 1870’s home is located in the California gold rush town of Sutter Creek. It is situated on the banks of the meandering creek, and is only one short block walking-distance to the town’s Main Street. 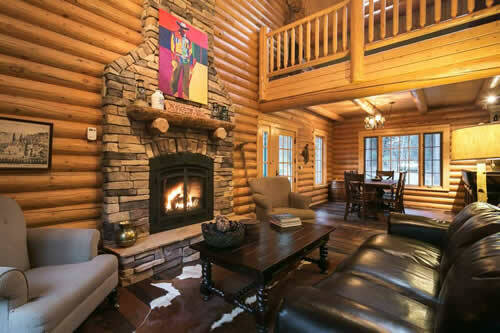 This custom-built log home has all the amenities of a 5-star hotel with total privacy and seclusion. Set in the foothills of the Sierra Nevada mountains just 2 hours from the Bay Area, this is the perfect getaway for your family and friends. Come stay in a secluded, custom-built, luxury log cabin nestled in the woods. Situated on five acres of private forested land in the heart of California’s historical Gold Country, Gold Creek Cabin is only a 2-hour drive from the San Francisco Bay Area and just over an hour from Sacramento. You’ll avoid the Tahoe commute traffic and feel so far away from it all. Gold Creek Cabin (3,500 foot elevation) is 38 miles (61 km.) downhill from Kirkwood Mountain Resort and just 16 miles (26 km.) uphill from Sutter Creek, one of the most popular and well-preserved Gold Rush towns, offering a variety of nice restaurants, antique stores, and unique shops. 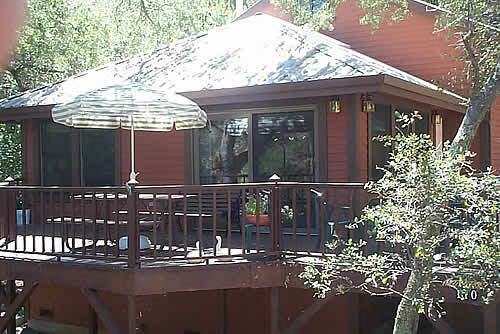 This cozy, picturesque vacation cottage with private deck overlooking a burbling creek is perfect for a romantic weekend. It’s private but close to downtown Sutter Creek’s many delights. Come stay in a beautiful vacation rental on the creek in a secluded neighborhood just two blocks from Main Street. You can walk to every place in town. The cottage sleeps 6 people and is dog friendly.